The the University of Lima is a private University which now has over 10,400 students, ten schools, a postgraduate school, a general studies program and a scientific research institute, along with many services for students, faculty, and the community at large. 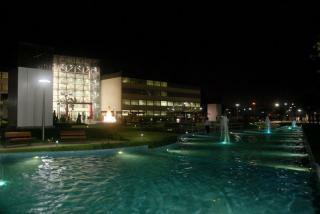 This reflection pool within the University is the proud work of Hugo and the Sacosi team. Before Radcon Formula # 7 was involved there were many leaks and cracks however after grinding out the cracks, treating them and applying Radcon Formula # 7 to the inside of the pool, they now have a water-tight result..Because Radcon Formula # 7 provides lifetime waterproofing it will continue to waterproof the pool for as long as the structure exists.